WellShare’s mission is to advance sustainable community health. We also work to reduce health disparities in Minnesota and around the world. But what exactly are health disparities? And how does WellShare’s work help to increase health equity? While Minnesota is ranked as one of the healthiest states in the U.S., it also has significant health disparities, which means that not everyone living in Minnesota has the same opportunity to be healthy. A recent report from MN Community Measurement (MNCM) entitled ‘2016 Health Equity of Care Report’ highlighted the stark differences in health care and health outcomes between certain population groups and regions in Minnesota. The report highlights that many people of color and specific ethnic groups such as immigrants and refugees, are less likely to receive preventive health care services and more likely to suffer from negative health outcomes. WellShare International has been working with underserved communities who suffer from the largest health disparities for almost 40 years. 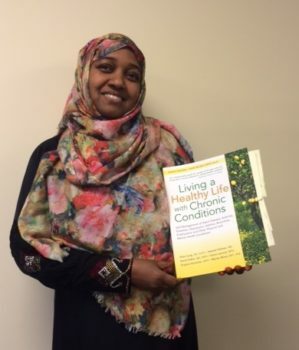 The Eliminating Health Disparities Program (EHDI), for example, aims to reduce the risk factors for diabetes, heart disease, and stroke in the Somali community by increasing daily physical activity and the consumption of healthy food. Program staff also conduct Chronic Disease Self-Management and Diabetes Prevention Program classes.In addition, health education materials are created in local languages as needed. The goal is to create an increased sense of well-being among the community members. One of the main reasons that this program and WellShare’s other programs are able to reach those in need are due to the Community Health Workers (CHWs). They serve as a bridge between community groups and the health care system and link community members to the health care services and social services that they need. Thanks to the EHDI program, and WellShare’s other programs, WellShare is contributing every day to reduce health disparities and increase health equity – enabling more and more people in Minnesota to receive the highest level of health. WellShare is a valued partner in this pilot because of its experience and personal approach to providing multi-cultural health education to new metro-area residents. WellShare International’s East African Smoke-Free Program staff have done a great job in raising community awareness about the dangers of secondhand smoke and have collaborated with community partners to increase tobacco-free spaces. It has been a really wonderful experience working as an intern at WellShare International and I am so grateful for the opportunity! I continue to learn so many useful things every day! I downloaded the reproductive health educational materials and they are fantastic! Thanks so much! I have had the opportunity to work with multiple WellShare staff on smoke-free housing initiatives, and have thoroughly enjoyed the collaboration. Their staff were professional and great team players. Thanks for sharing information with us for our patients and families [at Fairview]. I very much respect you, your team and your organization. The Young Achievers program is one of the most well-attended programs at Franklin Library. Youth in our community are consistently responsive to the opportunities for shared learning offered by this program.